Milwaukee… one of the most underrated cities in the country. This is especially true come summer time. Summer in Milwaukee is a cultural and entertainment experience unlike any other. Having not been born and bred in Milwaukee, it was an exciting surprise to see such volume and variety of events happening in the city. Growing up in New York and Chicago, where there is constantly events going on, it was electrifying to see that in Milwaukee, and it gives me the sense of “home”. Each weekend from June through Labor Day there is at least one major local event. From Irish Fest, to Bastille Days, to Festa Italiana… it’s hard to decide which to attend! These festivals draw large crowds and tourists from both near and far. In particular, Milwaukee’s own late-June-into-Early-July Summerfest, also known as “The World’s Largest Music Festival” or “The Big Gig”, takes place along Lake Michigan in downtown Milwaukee. There are concerts to please people of all ages and musical tastes each day and night over the 11 day period. Summerfest goers flock from all over the country to hear their favorite bands play outdoors in a variety of band shells all along the lakefront. 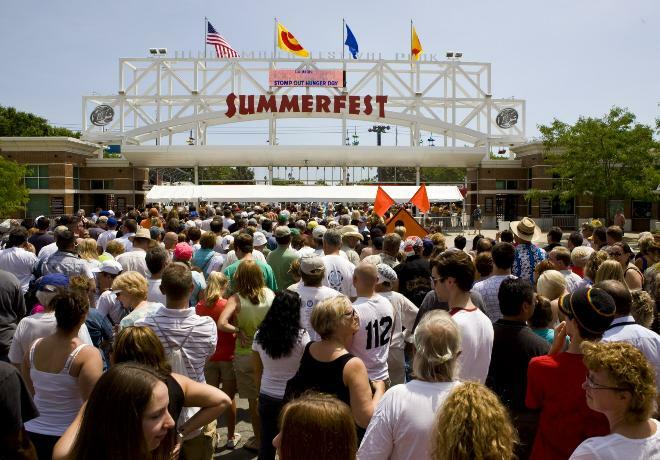 While attending Summerfest, a visitor can experience a little taste of all Milwaukee has to offer. In addition to music, there are food stands and kiosks from the hottest Milwaukee restaurants and bars. Saz’s is a staple at Summerfest. The sampler platter of sour cream and chive fries along with the mozzarella sticks gives visitors a real taste of Wisconsin! There are many other restaurants from Milwaukee including Water Street Brewery, AJ Bombers, Major Goolsby’s to name a few. Each of these showcase popular food items as well as locally brewed beer. In addition to the great music and variety of food, Summerfest and all of other local festivals provide a great people watching atmosphere. The festivals attract tourists from all over the state and the country. My favorites of the summer include Bastille Days and Brady Street Days. Each offer a slightly different cultural and entertainment experience. Don’t hesitate to remind your friends and family, both local and out-of-towners, about all of the fun there is to be had at Milwaukee’s festivals! ← Flex Your Brand, Go Digital!